WASHINGTON — The chairman of the Senate space subcommittee said at a hearing April 26 that it may be time for the United States to update a key space treaty to reflect growing commercial space activities. Sen. Ted Cruz (R-Texas) raised the prospect of updating the 50-year-old Outer Space Treaty, widely considered a cornerstone of international space law, at a hearing to discuss other regulatory reforms needed to promote continued growth of space companies in the country. Cruz didn’t elaborate in his remarks about what changes he wanted to see in the treaty. Some space commercialization advocates, though, have previously suggested amending the treaty to address issues such as the ability to make claims on celestial bodies and have rights to resources there. Later in the hearing, Cruz asked the four witnesses, all heads of commercial space companies, how relevant they consider the treaty to be today. “I think the treaty needs to be updated,” said Robert Bigelow, founder of Bigelow Aerospace. Some elements of the treaty, such as prohibitions on placing weapons of mass destruction in space, should be retained, he argued, but other provisions related to commercial space activities should be reexamined. The treaty, he noted, allows countries to establish bases on the moon and other bodies, but places no limits on the number, size or location of those bases. He suggested the development of a defined area around bases that would provide a zone of non-interference, or safety buffer, from other facilities. Amending the treaty would require considerable effort at the international level, which Bigelow acknowledged would be a challenge. “The risk of that is trying to get consensus, where you would be trying to get a large population of countries to agree,” he said. The three other witnesses did not address the question of revising the Outer Space Treaty, but did have recommendations for federal policy changes to support the commercial space industry. George Whitesides, chief executive of Galactic Ventures, which operates suborbital spaceflight company Virgin Galactic and small launch vehicle developer Virgin Orbit, called on increased funding for the Federal Aviation Administration’s Office of Commercial Space Transportation (AST), which both licenses and promotes the commercial launch industry in the United States. Many in the industry have expressed concern that growth in the industry could overwhelm the small office, whose annual budget is less than $20 million. “It may be rare for companies to be pushing for more funding for their regulators, but we really think this is a case where is could be a good investment for the country,” he said of increasing AST’s budget. Rob Meyerson, president of Blue Origin, also supported a budget increase for AST but added that the office should focus on its current responsibilities to license commercial launches and not seek additional roles. Blue Origin is currently developing an orbital launch vehicle, New Glenn, with a reusable first stage that will initially launch from Cape Canaveral. Meyerson said an issue for him was “conflicting expectations on the regulatory process” between the FAA, which will issue launch licenses for those flights, and the U.S. Air Force, which oversees the Cape Canaveral launch sites and Eastern Range, operated by the 45th Space Wing. Andrew Rush, chief executive of space manufacturing company Made In Space, emphasized the government’s role in fostering the development of new technologies and businesses. He said grants from NASA’s Small Business Innovation Research (SBIR) program and access to both parabolic aircraft flights and the International Space Station helped demonstrate the company’s 3-D printing technology, which has now attracted commercial interest. “Without infrastructure like the Flight Opportunities program, the SBIR program and the International Space Station, we could not develop this capability at the price that we developed it at, nor in a step-by-step fashion,” he said. He said NASA and the Center for the Advancement of Science in Space, which operates the portion of the ISS designated a national laboratory, should do more to encourage “commercial pathfinding” on the station like what Made In Space has done, in part to develop applications that can make use of future commercial space stations. “We need a stepwise transition to expand operations first on ISS, and then perhaps next on a commercial module attached to ISS, and then ultimately to a free flyer,” he said. Bigelow, whose company is developing expandable modules for use on the ISS or as standalone space stations, also urged NASA to better develop plans to transition research from the ISS to commercial stations. He noted his company is maintaining plans to have two of its B330 modules, each with 330 cubic meters of volume, ready for launch by the end of 2020 for use in low Earth orbit or cislunar space. 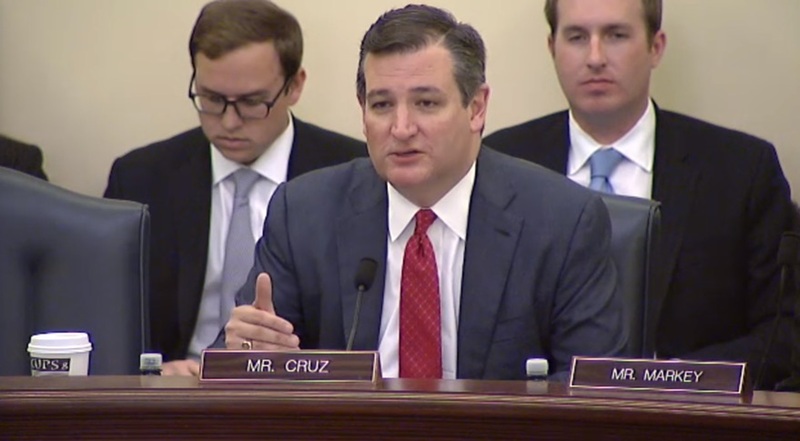 Cruz, in a later discussion with reporters, said this hearing was the beginning of an effort to review commercial spaceflight issues that could lead to legislation that builds upon the Commercial Space Launch Competitiveness Act, passed in 2015. Cruz didn’t state when such a bill would be introduced, although industry sources said it could happen later this year. “We’re going to spend some time listening and learning first,” he said.